9Marks exists to equip church leaders with a biblical vision and practical resources for displaying God’s glory to the nations through healthy churches. To that end, we want to see churches characterized by these nine marks of health. 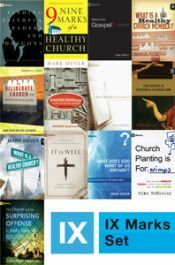 This 13-volume set explores and expounds the nine marks of a healthy church that Mark Dever outlined in his widely recognized work The Nine Marks of a Healthy Church.